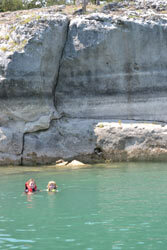 With stunning emerald green water, Canyon Lake is the third deepest lake (120' or more) in Texas, has an average depth of 43', and it is one of the clearest of all the Texas Lakes. 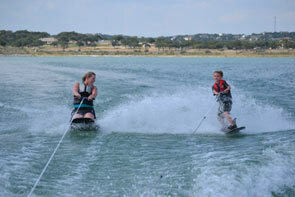 With over 382,000 acre-feet, a surface area of 8,230 acres, and 80 miles of shoreline, Canyon Lake is perfect for fishing, swimming, boating, camping, and all other water recreation sports. 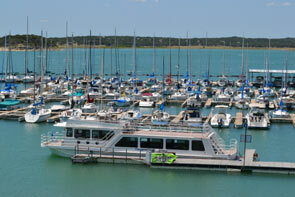 The lake has 23 boat ramps, two marinas, five day use areas, and four campgrounds operated b the Corp of Engineers. Fishing is good for black bass, striped bass, cannel and blue catfish. Boat docks are not allowed on the lake, which helps to keep the lake clear and pristine, and there are plenty of campgrounds and lodging options available. 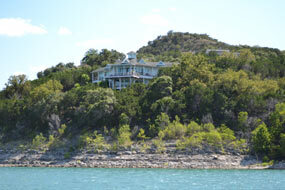 Read our review of Canyon Lake to learn more about why we love this lake.